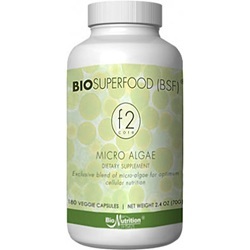 The BioSuperfood (BSF) formulas are whole food products composed with four of the most nutrient dense algae found on earth. Each formula delivers a different nutritional value. The products are presented in vegetable capsules that are easy to swallow and practical to use. Increase mental focus and clarity. Better mood and sense of well-being. All formulas are certified under Health Canada Natural Product program and allowed the quote "a source of antioxidants for the maintenance of good health." BSF formula F2 Core is suggested for general nutritional support of the immune system, and as a replacement of some supplements and vitamins; it is also recommend for increased vitality, strength and endurance for general activity, and in support of sports and fitness practices. As a source of nutrients for the maintenance of good health our formula F2 Core can be taken by all. The capsule or its powder content can be taken with or without food. For infants take up to 2 capsules with water daily, no more than one capsule per intake with at least a three hour interval between intakes. For children and teens, take 2 to 6 capsules with water daily, no more than two capsules per intake with at least two hour intervals between intakes. For adults, take 6 to 12 capsules with water daily, no more than three capsules per intake with at least two hour interval between intakes.